Our best friends, who are also our neighbors, have a gigantic covered patio. I consider it my home away from home during all warm months. Patio dinners just cry out for fresh vegetables, herbs, and bright citrus flavors ... which is why this salad is oh-so-perfect for such an occasion. We are all not-so-patiently awaiting the arrival of fresh herbs and vegetables from Justin and Erin's raised bed garden. With an upcoming bounty of locally garden-grown veggies, I have a feeling this salad will be a mainstay of our summer patio gatherings. Ribbons of raw zucchini are tossed with lemon Parmesan dressing, toasted pine nuts, and strips of fresh basil. It's simply delicious. 1. Heat a small dry skillet until very hot. Add the pine nuts and roast for a 1-2 minutes or until they are light brown and smell toasty delicious. Remove and cool. 2. 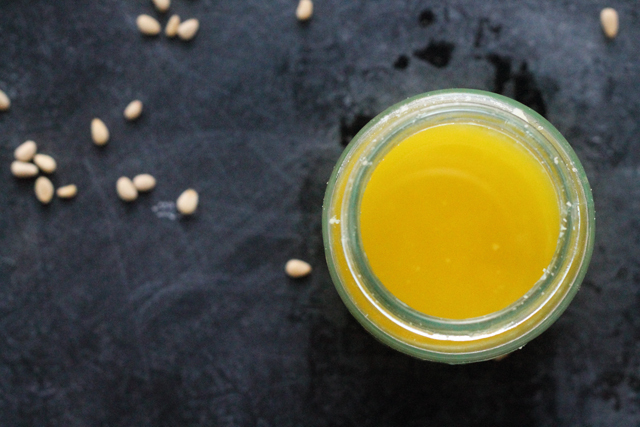 Combine lemon zest, lemon juice, Parmesan cheese and olive oil and blend until almost smooth. A mini food processor works best I store dressing in a mason jar for easing shaking right before the salad is served. 3. Wash and dry zucchini, cut off each end. 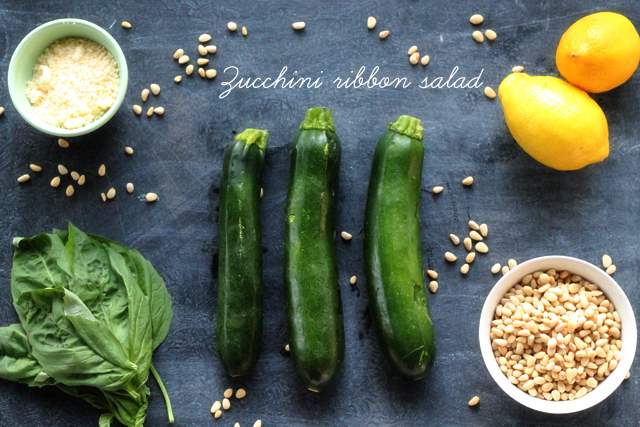 Peel zucchini with a vegetable peeler lengthwise into ribbons. 4. 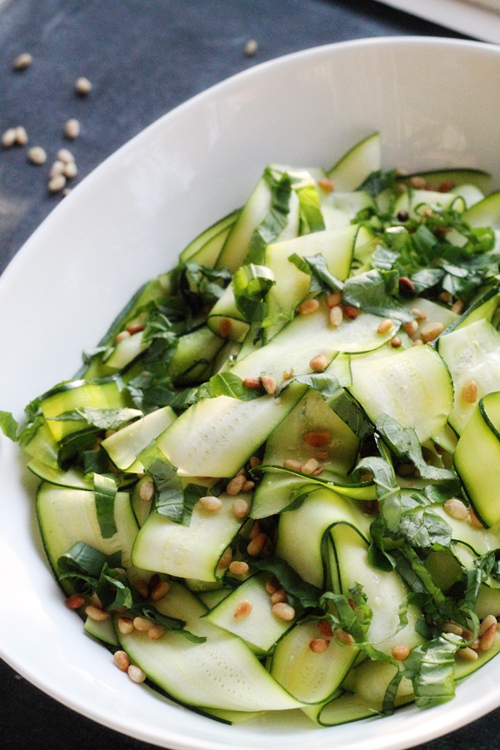 Combine zucchini ribbons, pine nuts, and torn basil leaves in a large bowl. Dress the salad just before serving, tossing to combine. Top with Parmesan shavings if you're feeling fancy. 6. Get out on the patio with a bourbon sweet tea and eat a delicious meal with your neighbors. great photos, Kara! I'm super impressed (and cannot wait to try this recipe)! So pretty! I can't wait for summer squashes and the like. Gorgeous photos ... and a delicious sounding recipe! So glad I stumbled on your blog via Twitter! Made this and it was delicious, thanks. Might try with mint instead of basil for fun.